Hard fought contests, upsets a possibility but when the opening two matches in the first round of the Uncle Pop 2017 ITTF Women's World Cup presented by Polar Naturals came to a conclusion after over two and a half hours of play, it was the seeded players who prevailed. Li Jie of the Netherlands, the no.7 seed accounted for Austria’s Liu Jia, the no.12 seed (11-9, 11-9, 4-11, 11-8, 4-11, 10-12, 11-5), before in an equally close contest, Chinese Taipei’s Cheng I-Ching, the no.5 seed, ended the progress of Georgina Pota, the no.10 seed (7-11, 7-11, 11-8, 13-11, 11-7, 7-11, 11-4). The contest between Li Jie and Liu Jia was a long drawn out affair; Liu Jia may have improved her skills against defensive players but securing points consistently with a tirade of forehand top spin strokes in not her forte. Thus a combination of top spin and push strokes was the order of the contest; on several occasions this gave Li Jie the opportunity to attack and break the rhythm of her adversary. A full distance seven games duel, at the change of ends there was little to choose with Li Jie holding a one point lead at 5-4; however, somewhat surprisingly Liu Jia was to win only one further point and that was not of her own making. 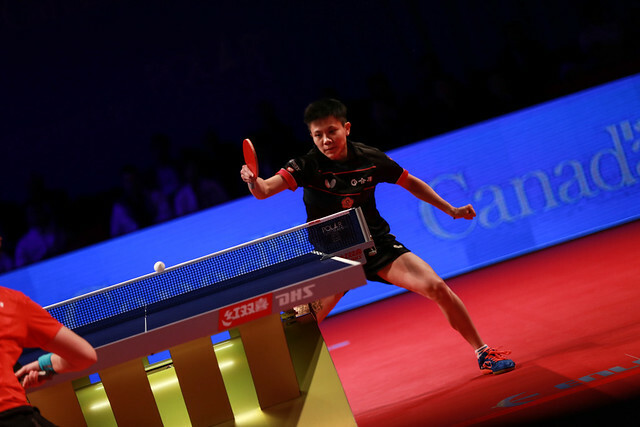 At 7-4, the service from Li Jie never reached the surface of the table; the ball hit the end of the table and rebounded to the surrounds. Calmly Li Jie collected the ball and returned to duty; Liu Jia became hesitant, she made mistakes. Success for Li Jie and her first ever in a Women’s World Cup; her one previous appearance was in 2015 in Sendai when also seeded, she had been beaten in the opening round by Turkey’s Hu Melek. Somewhat conversely, in what was her 12th Women’s World Cup appearance, it was the sixth occasion when Liu Jia had not advanced to the last eight. Acclimatised, Georgina Pota made the better start in her contest against Cheng I-Ching; gradually the young lady from Chinese Taipei acclimatised. At the start of the sixth game, Cheng I-Ching appeared to be assuming control, she won the first three points; Georgina Pota elected for “Time Out”, she duly levelled at 5-all, progressing to win the game and force a decider. Time and again, a good start in a deciding game determines the outcome; it was to prove the situation. Cheng I-Ching established a 5-2 lead at the change of ends, it was a vital advantage, she never looked back. Defeat for Georgina Pota was thus a repeat of the previous two most recent Women’s World Cup finishes; in both Sendai in 2015 and last year in Philadelphia she departed in the opening round. Notably in 2014 in Linz on her second appearance in the competition she finished in fourth place, the best ever performance by a Hungarian.